If you’re researching legal Georgia sports betting, you probably haven’t come up with much so far. That’s because there’s an almost complete dearth of gambling in the state. Still, where there’s a will there’s a way, and that’s a fact that hasn’t been lost on the millions of Georgia residents who gamble on sports each year. By all measures, legal sports betting is on a dramatic rise throughout both Georgia and the rest of the United States. The various sports leagues and local governments around the country have all been the beneficiaries of this increased attention and interest. Americans spend billions every year on sports betting, and some of this money is surely coming from Bulldog fans and Falcons fan in GA. Although their bets aren’t being placed in state, rather they are using online offshore sportsbooks. These websites provide a safe way to win big and avoid any trouble with the law. 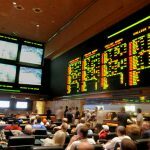 We’ll go over why that is, which teams you can wager on, where the nearest sportsbooks are, and everything else you need to know concerning legal sports betting in Georgia. 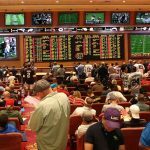 Is Land-Based Sports Betting Legal In Georgia? No, land-based sports betting is not legal in Georgia. But that’s hardly Georgia’s fault since the federal Wire Act of 1961 and the recently repealed Professional and Amateur Sports Protection Act of 1992 (PASPA) were both specifically designed to suppress states’ rights for land-based sports betting. While this doesn’t excuse the state’s lack of other basic gambling freedoms, it does spread the onus of enforcing any laws dealing with land-based sports betting to the federal government’s shoulders, where it is considerably less likely to be enforced. But land-based sports betting in Georgia is still somewhat risky, as it requires a physical transaction between local bookies who may or may not be under police investigation. If you don’t want to get stung, there’s a simple fix: Go online to sign up for legal Georgia sports betting. However, there are others that argue that valid laws must be explicitly exclusive, not implicitly inclusive. Therefore, online betting – and online sports betting to offshore sites in particular – may be cautiously pursued inside the state. Of course, there is another federal law to consider as well. The Unlawful Internet Gambling Enforcement Act (UIGEA, 2006) nominally addresses Internet-based sports betting, but the mechanism of its application is exceedingly limited. Instead of going after the people on either end of a given bet, the UIGEA simply bans financial institutions from knowingly processing payments made in connection with sports betting. It is little more than legislative fluff. In that way, the UIGEA is just like the Wire Act turned out to be. In actual practice, these laws are both concerned only with those entities that take sports bets, not the private citizens who place them. Thus, online sportsbooks – agencies that would otherwise be targeted for criminal prosecution – simply opened up shop overseas, outside of US jurisdiction. This has proven to be an effective and legal workaround, with the result that roughly 97% of all US sports betting goes through these businesses. And so does all legal Georgia sports betting. In terms of casinos, kiosks, or storefronts, there’s nowhere to bet on sports in Georgia. The state simply doesn’t allow traditional gambling facilities to operate inside its borders (save for charitable bingo/raffles and the Georgia State Lottery, because the next time a government’s own rules apply to itself will be the first). However, you can safely enjoy legal Georgia sports betting without even leaving your house. Online sportsbooks like Bovada, BetOnline, SportsBetting, and 5Dimes are free to join, and each one brings a little something different to the table. Better yet, all of them place a strong emphasis on customer support and quick payouts. Even though there are no casinos or racetracks anywhere in Georgia, there are several options outside the state. These include cities in Florida or Alabama, both of which have various forms of casino gaming on tap. If you’re looking for the closest place to bet on sports, however, none of those will do you any good. You’d have to hop to one more state over to either West Virginia or Mississippi. Fortunately, the solution is even closer at hand, as all it takes to get started betting on sports is an Internet connection and a couple of dollars. If any concrete laws are written to have legal sports betting in Georgia there is a good chance that these cities would be the first to offer them. 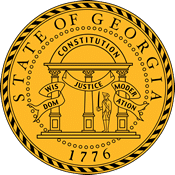 Georgia state law §16-12-20 et seq. explicitly bans most forms of betting. In fact, the only types of gambling allowed in the state are the state lottery, charitable raffles, and bingo games. There are no commercial or tribal casinos in the state, and Georgia residents do not have access to horse or greyhound racetracks, either. Curiously, convenience stores in Georgia can operate licensed coin-op machines, provided winnings are doled out in the form of store merchandise, gasoline, or lottery tickets. Cash prizes are disallowed by law. In fact, even the state’s bingo allowance is pretty unfriendly to gamers. Georgia brags that its bingo statute “is one of the most restrictive in the country,” only allowing $1500 in prizes per session (or $3000 per week). Despite these odious regulations, bingo remains so popular in the gambling-starved state that the industry still manages to rake in several million dollars each year as thousands of people line up to play at various halls and clubs every single day. As far as sports betting laws are concerned, Georgia doesn’t actually have any at the state level, having relied on the Wire Act, PASPA, and the UIGEA to define its position. However, even if the state actually views this sort of entertainment as “illegal gambling,” it sure doesn’t act like it. Nobody has ever been arrested for using an online sportsbook to place a bet in Georgia, and any such laws would be largely unenforceable. Even though Georgia is a barren wasteland when it comes to legal gambling and sports betting, it’s a bona fide oasis for professional and collegiate athletics. Except for the NHL (the Atlanta Thrashers having relocated to Winnipeg, Manitoba, in 2011), Georgia is represented by every major sports league in the country. Falcons fans can be found all around the southeast, and Braves fans can be found representing their team all across the country. The same can be said for Georgia Tech and Georgia Bulldog alumni supporting their alma mater everywhere they go. Betting on horse racing has not been legalized in Georgia. It did seem likely after the Senate passed SB264 and SR135, both of which sought to legalize horse racing and allow the voters to decide if pari-mutuel wagering would be allowed under the umbrella of the government-owned Georgia Lottery Corp. Unfortunately, the measure was not signed into law, and all Georgia-based horse racing plans have been put on hold since. However, many of the online sites where residents can enjoy legal Georgia sports betting also feature exciting racebook options. So while the state isn’t great for big fans of the ponies, online racebooks like Bovada, BetOnline, SportsBetting, and 5Dimes do their best to make up for it. Horse racing enthusiasts can wager on on races like the Kentucky Derby, Pegasus World Cup, and other major races happening in the US and abroad. Daily fantasy sports, or DFS, is neither legal nor illegal in Georgia. Like many states, Georgia has no official stance on the legality of DFS or whether it can reasonably be considered a game of skill or just downright gambling. There have been several attempts to introduce bills to regulate the activity, and even with many residents support, all of those attempts ultimately failed. In the meantime, Georgia residents can continue to enjoy daily fantasy sports, as big-name providers like DraftKings and FanDuel have no plans to withdraw from the state anytime soon. In fact, most fantasy sports vendors can work freely in Georgia for the time being. Which is a good thing, as Georgia’s lack of gambling facilities means that DFS leagues are one of the most readily available for-money entertainment outlets in the state. Can I Bet Real Money On Sports In Georgia? Legal Georgia sports betting does indeed require legal US tender. (Unless you use Bitcoin, in which case you’ve simply converted said tender into something a little juicier beforehand. Isn’t crypto a peach?) Most online sportsbooks accept major credit and debit cards (although only Bovada takes American Express) and other deposit methods, including personal checks, money orders, and bank transfers. There are other options for international players (Skrill, Neteller, PayPal, etc. ), and every different method has different limits and transfer times. Payouts typically work the same way as deposits, minus the credit card options. Is Online Sports Betting Safe In Georgia? Yes, online sports betting is safe in Georgia. In fact, it’s probably safer to bet online than it is to shop at Amazon or any similar Internet retail store. This is because all the best sportsbooks use best-in-class encryption and data security practices. Add Bitcoin to the mix, and you’re all but guaranteed an anonymous, “unhackable,” eminently safe Internet betting experience. Part of the reason that sites like Bovada et al. are held in such high regard is that they hold you and your personal information in the exact same esteem. Will Sports Betting In Georgia Ever Be Legal? 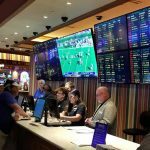 It’s only a matter of time before legal Georgia sports betting becomes available in various establishments statewide. However, due to the state’s regressive attitude towards gambling in general, it will probably take longer than most other parts of America to fall in line with the public’s changing attitude on sports betting. Of course, you probably won’t even notice when it does, because legal online sports betting is already so accessible and convenient. Will I Get Arrested For Sports Betting In Georgia? Nope. That’s the beauty of the Internet: It basically turns prohibited Georgia sports betting into legal Georgia sports betting. As long as you use common sense and don’t go out of your way to advertise your sports betting prowess, you won’t be arrested for sports betting in Georgia. If you’re the cautious type, however, you might consider funding your gambling via Bitcoin for an added layer of security and anonymity. What Is the Sports Betting Age In Georgia? Are There Mobile Sports Betting Apps Available In Georgia? There are no official mobile sports betting apps for any of the major sportsbooks available in Georgia (or anywhere else, for that matter). This is because, due to Apple’s and Google’s marketplace restrictions, such gambling apps are currently banned. Anything you find floating around out there that says otherwise is trying to sell you snake oil, and you should not trust any alleged sportsbook app unless it is the official property of Bovada, SportsBetting, Bookmaker, or 5Dimes. 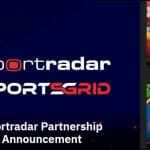 In the meantime, you can visit the sportsbook(s) of your choice via your smartphone or tablet browser and enjoy the streamlined mobile versions each vendor has to offer. Such mobile “web apps” are the next best thing to proper app releases, and they’re more than adequate while everyone waits for something better. Where Is The Best Place To Bet On Sports In Georgia? You should without a doubt join several online sportsbooks to maximize your winning potential. However, if you insist on only signing up at one site to handle all of your legal Georgia sports betting, you’re probably best off making that one be Bovada. It’s the true veteran of the bunch, having set the standard for much of the Industry over the last several years. Bovada has best-in-class customer service, too, which certainly doesn’t hurt, and the fact that the company has never missed a payout ought to make you even more confident to invest your gambling budget with their stellar service. Should I Use A Local Bookie In Georgia? Georgia is not the place to use a local bookie. Not for sports betting, and not for anything else. While simply placing a sports bet with such a character (replete with a trench coat, fedora, and smoldering cigar between sausage fingers, no doubt) probably won’t get you in too much trouble, there’s always a chance that you could get caught up in whatever shenanigans said bookie’s involved in. There’s no reason to get snagged in a police dragnet if you can avoid it. Plus, online sportsbooks have a customer service reputation to maintain. With a local bookie, there’s no recourse if the guy or gal wants to split with your cash. Do Any Casinos In Georgia Have Sports Betting? No. There are no casinos in Georgia. But even if there were, they would not be allowed to offer sports betting of any kind. Georgia’s long-standing conservative stance when it comes to gaming can be felt across its borders. 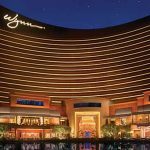 The state has been very slow in allowing in-person gambling at all so if they ever decide to allow casinos they will most likely be limited at first. Can I Bet On Sports With My Friends In Georgia? Some states have special carve-outs on the books for so-called “social” or “private” gaming, enumerating their residents’ rights to host and/or partake of private sports betting events, poker games, and various other types of traditional casino-style amusements. Georgia, naturally, does not. That said, if you simply want to put a little money on the line against your pals in the privacy of your own home, there’s virtually zero chance that you’ll run into any problems. Just don’t advertise these group meetings to the wider world, and you can enjoy legal Georgia sports betting with your friends as often as you please.